Rent all year round, on a weekly basis and in a calm and quiet residence, one of our 4 charming villas, The Cypresses Villa, listed 4 stars and labelled “Qualité Var” that accommodates from 8 to 10 people. It is perfectly fitted with dining room, living room, 4 bedrooms, Mezzanine living room, 2 shower rooms, 2 toilets, 2 terraces, large garden, parking area and free Wi-Fi access. You can rent a 9x10 m Leader speedboat with skipper upon request. Pleasant combination between sea and Provencal countryside, the hamlet of Cabasson, formerly inhabited by fishermen, has kept its original character. In this haven of calm and peace, you will rent on a weekly basis and all year round, our charming villa, The Cypresses, which is listed 4 stars and labelled “Qualité Var”. 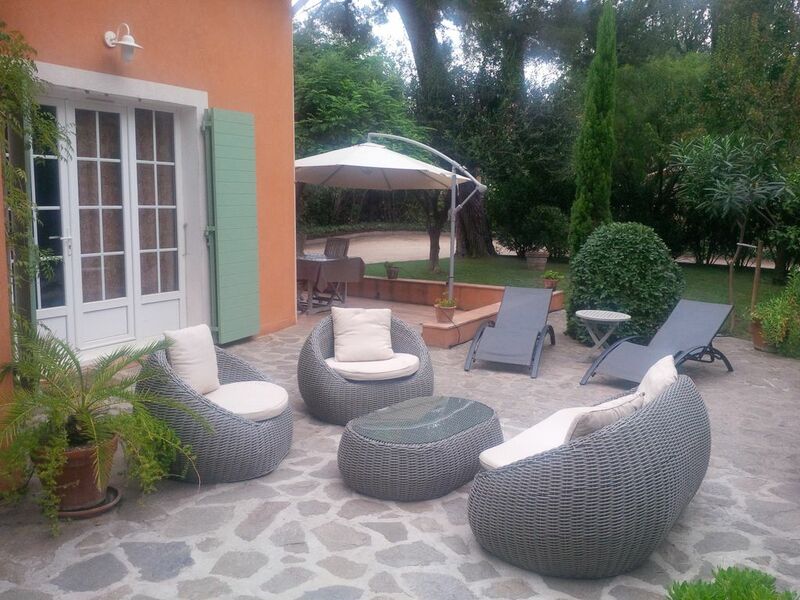 You will have all modern conveniences for 8/10 people with private fenced garden in a calm and quiet property in Bormes-les-Mimosas in the Var department on the Côte d’Azur in France. You will enjoy crystal-clear waters and particularly hot waters at the beaches of Cabasson and Brégançon that are often mistaken but yet very different. The access to the first one is via small dunes covered with vegetation, tamarisks and reeds. The second one is accessible via a small rocky path under pines between the path to the fort and the fishermen cabins. Its water is particularly clear and hot and sheltered from the Eastern wind. On the ground floor: bathroom with bath, vanity unit, bidet, magnifying mirror and electric heated towel rail, shower room with shower and vanity unit and 2 separate toilets including 1 with washbasin. 2 terraces (48 m² and 23 m²) including 1 shaded with garden table for 10, parasol, armchairs, chairs, deck chairs and sunloungers. On the ground floor: Kitchen fitted with refrigerator, built-in oven, microwave, 4-ring hob, dishwasher, double sink and household appliances (electric coffee machine, iron, ironing board, pressure cooker, toaster and vacuum cleaner). Garage with washing machine, tumble dryer, freezer and electric water heater Outside: 2 terraces (48 m² and 23 m²) including 1 shaded with garden table for 10, parasol, armchairs, chairs, deck chairs, sunloungers and clothes horse. Close to the flowered village of Bormes-les-Mimosas and the seaside resort of the Lavandou, you will discover a small Provencal hamlet within 10 minutes on foot from the fine white sandy beaches of Fort de Brégançon in front of the Porquerolles Island. The Domaine de Valcros combines the authenticity of the Provencal lifestyle and the serenity of an unspoilt coastal setting. Overlooking the green hills of the Provencal village of La Londe, nestled against the foothills of the Massif des Maures, this 3200-acre estate opens onto the Mediterranean Sea and the Iles d’Or. Discover the Golf de Valcros: 120-acre 18-hole course, lakes of several acres and fairways leading up to 600 m in altitude. Open since 1996, the Golf de Valcros is located between Saint-Tropez and Toulon. Nestled more particularly in a rugged valley of the Massif des Maures, this 18-hole course is not too physical but is sufficiently challenging to interest any golfer. The course actually requires technique and precision. The experienced golfers will find a site that meets their requirements. South-East-exposed, sheltered from the wind and along a river, the narrow and wooded course is very particular. Its established reputation extends far beyond the Varois borders.